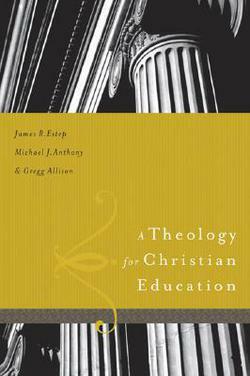 A Theology For Christian Education, edited by James Estep, Michael Anthony, and Gregg Allison is a well-rounded primer which is suited for pastors in the local church and Bible College/Seminary professors in the classroom. One might consider the first five chapters as the backbone of the book. These chapters help shape the philosophy of education so that the educator has biblical framework for building into the lives of students. The remaining chapters deal with the finer points of Christian education and address matters of Christology, pneumatology, anthropology, hamartiology, soteriology, and ecclesiology. Students of systematic theology will be familiar with these categories which run through the fabric of this excellent work. Pastors and professors will be challenged and encouraged by the content here. There is plenty of encouragement in these pages; encouragement that most pastors and professors could benefit from.